If you start the AC and find that it is constantly running, you’ll want to have that fixed as soon as possible. Spring is here and pretty soon you will be switching your HVAC unit from heating to AC. If you start the AC and find that it is constantly running, you’ll want to have that fixed as soon as possible. Normally, your HVAC unit is supposed to cycle itself on and off automatically based on the temperature in the room. Dirty Evaporator Coil: If you didn’t have your HVAC preventative maintenance performed on schedule, then the evaporator coil inside the unit could be dirty. That dirt can keep the coil from operating normally. It can also cause the unit to have to work much harder in order to reach the desired temperature. Clogged Air Filter: Your HVAC unit pulls air in through a filtered intake vent. That filter needs to be changed or replaced regularly. A clogged air filter means that the unit can’t pull in an adequate amount of air and it won’t be able to function properly. Air Filters that Don’t Fit Your Unit: Along with keeping filters clean, you also need to make sure you have the correct type of air filter for your system. If you’re having air flow difficulties, you may have the wrong filter. 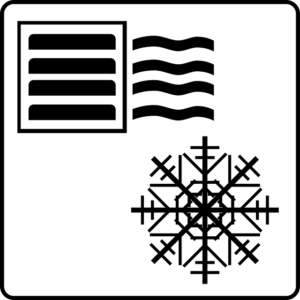 Low Refrigerant Charge: If you turn on your air conditioning unit and it’s not putting out cold air, you may need more refrigerant. If the refrigerant is low, the HVAC unit can run for hours without the air getting any cooler. A Broken or Malfunctioning Thermostat: In a way, the thermostat is one of the most important components of your HVAC system. If that is malfunctioning, it can’t tell the system when the air has reached the right temperature. A broken or malfunctioning thermostat can cause a significant amount of trouble for your system. Leaking Ductwork: Unfortunately, leaks in ductwork is a pretty common issue in both residential and commercial HVAC systems. The ductwork should be inspected as part of your regular HVAC maintenance. William E. Kingswell has remained a distinguished provider of commercial and residential heating and cooling services since 1927. We have provided an unmatched level of customer service to all of our clients, and we enjoy being the preferred HVAC equipment distributor of countless customers. We offer a comprehensive range of high-quality heat pumps, boilers, unit heaters, HVAC accessories, and more. William E. Kingswell works with businesses and homeowners throughout Maryland, Washington, D.C., and Virginia, including Baltimore, Frederick, Annapolis, Fairfax, Manassas, Richmond, Fredericksburg, Virginia Beach, and Leesburg. To learn more about our extensive range of SpacePak, Concord, Allied Commercial, and Bard HVAC equipment, give us a call at 301-937-1900 or contact us today! We’re social! For all of the latest updates, “like” and “follow” us on Facebook, Twitter, and LinkedIn! This entry was posted on Friday, March 22nd, 2019 at 11:10 am. Both comments and pings are currently closed.